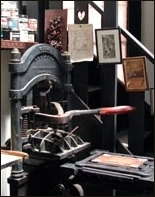 Dard Hunter’s Mountain House Press has been recognized by collectors and scholars as one of the most unique printing establishments of the 20th century. 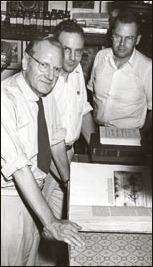 Few people realize the extraordinary lengths Hunter went through to ensure that his research on papermaking was presented in an accurate and interesting manner. The eight books that were produced at the Mountain House Press from 1922-1950 represent the culmination of over one million miles of travel to the most remote regions of the world, gathering rare paper samples from many destinations. 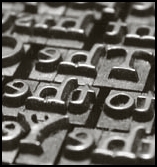 Each book was printed on an iron hand press with hand set type, many with his own designed typeface or that of Dard II. 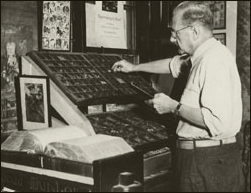 For many years, Hunter had wanted to print a book based on several articles he had initially published on the history of hand papermaking and watermarks. Initially he had no thought of producing this book himself, but he was persuaded to print it using his type. Thus, Mountain House press was begun. Old Papermaking, completed in 1923 was a financial and critical success. Like many of his later books, it was designated on the the “Fifty Books of the Year” by the American Institute of Graphic Arts. On the title page, there is no information about the printer/publisher, but Hunter’s printer’s mark is prominent. This mark, based on the branch and leaf motifs of the Marlborough books, also includes a Bull’s head, an old watermark device. The printer’s mark changed with each book as one leaf was added to denote the total number of books printed by Dard Hunter’s press with his or his son’s, type. Hunter’s next book, The Literature of Papermaking 1390-1800 was completed in 1925 and is a large, folio format well suited to his 18-point type. Hunter setting type for Papermaking By Hand in America. Note the dictionary atop the carved Dard Hunter’s bookshelf which was made by him in the early 1900’s. For his next seven books, Hunter concentrated on oriental papermaking and traveled to mills in foreign lands to gather first-hand information and materials. In early 1925 he was on a ship to the South Seas Islands to record the manufacture of beaten bark cloth called tapa. There he collected materials, tools, and information that resulted in his 1927 book, Primitive Papermaking. It is on the title page of this book that the imprint Mountain House Press first appears. In 1932, Old Papermaking in China and Japan was published by the Mountain House Press. It was the last book to be printed with Hunterís type. In 1933 he traveled to Japan, Korea, and China; in 1935, to Indo-China and Siam; and in 1937-38 to India. Several books on hand papermaking in these countries followed, all quartos printed with Caslon type. The studio as it appears today, much as Hunter had it during his lifetime. For the last book to be written by Hunter and published by the Mountain House Press, Dard II hand cut and cast a completely new font of type. This book was the magnificent Papermaking by Hand in America completed in late 1950. Over three hundred pages long with nearly 200 illustrations and facsimiles of old watermarked papers, this book remains Hunter’s masterpiece. The leaf on the printer’s mark designating this book has fallen from the branch, signifying the last book he would print at Mountain House Press. He did not retire from writing, however, and published his autobiography, My Life With Paper, in 1958. Mountain House Press remained active during the lifetime of Dard Hunter II. His masterful printing is evidenced in The Life Work of Dard Hunter, a two volume set which chronicles the life of his father. Volume I includes 198 text pages with 194 hand printed and 65 black and white illustrations. Many of these were painstakingly printed to resemble the paper and color from Dard Hunter’s original drawings. Volume II has 25 color and 75 black and white illustrations, 34 paper specimens, and 23 title page reproductions. These books represent a true labor of love. Today, the Mountain House press is still in operation. It is here that we print many items available through Dard Hunter Studios.